In the literal AND metaphorical sense: Food and anything else that nourishes, excites and inspires me ... plus all the stuff that ends up on my plate, which I really could do without!!! 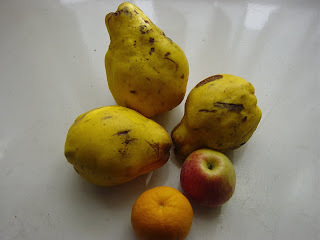 - but not everyone has seen quinces in real life. 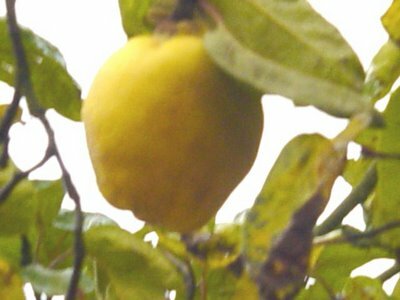 In Germany, everyone knows that they are yellow, because the term "quince yellow" has survived to denote a particularly bright yellow (quittengelb), even though the fruit weren't to be seen anywhere. Until, that is, around 2005, I'd say. Since then I have certainly noticed wide-spread interest in the food blogging community. I also saw my first one, 'in situ' so-to-speak, at another NT property, Moseley Old Hall near Wolverhampton, around that time. Subsequently, I came across them at farmers' markets here, and this year even at a completely 'normal' market in Frankfurt. And on several stands at that. “It's a soft perfume, rose-like, a little sickly but reminiscent of honey, too. 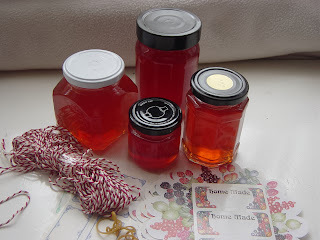 I made quince & coriander jelly this time. My recipe was from: The Complete Book of Preserves & Pickles by Catherine Atkinson and Maggie Mayhew. They are extremely versatile.Apart from jelly, you can add them to apple crumble, make compote to eat alone, with cream or ice-cream, or stir into yogurt. They can be baked as tarte tatin or as muffins, and even combined with meat in casserole or tagine dishes. Some people also make quince vodka. And let's not forget quince fruit paste - some of you may know this as membrillo. Sounds good to give them a try! Let's get the recipe first. Its an useful post, thanks a lot for sharing.